Costas Mamalakis at the Historical Museum of Crete. Photo: Mike Sweet. Patrick Leigh Fermor and SOE in Crete – Costas Mamalakis is giving the next PLFS lecture. Costas Mamalakis is Crete’s leading expert on the Second World War and the resistance in Crete. Consultant in Modern History to the Historical Museum of Crete, Costas has been the moving force behind the publication of several memoirs of the resistance, including the most recent: ‘Tom J. Dunbabin: An Archaeologist at War’. Costas will be spending the week prior to this presentation reviewing documents in the PLF Archive in Edinburgh, and will be able to bring new insights to the many documents in Greek that have yet to be properly evaluated. He will be supported by Chris and Peter White and Gabriella Bullock. Monday 1 February, 7.15pm at Great Hall, Hellenic Centre, 16-18 Paddington St, London, W1U 5AS. Contact info@ patrickleighfermorsociety.org. This entry was posted in Abducting a General and tagged Chris White, Costas Mamalakis, Cretan resistance on January 23, 2016 by proverbs6to10. A bond deeper than blood. The friendship forged in wartime Crete between Patrick Leigh Fermor and shepherd George Psychoundakis was commemorated in George’s memoir about the Resistance, The Cretan Runner. With the book republished, it was time to meet again. The bashful Briton is Patrick “Paddy” Leigh Fermor, traveller, scholar- gypsy, war hero and writer of genius. His fiery friend is George Psychoundakis, author of The Cretan Runner, an extraordinary account of the anti- Nazi Resistance on the island, which was translated by Leigh Fermor and is now republished. Paddy and I have been sitting in the front room of George’s small vine-clad house, outside Khania in western Crete, for more than two hours now. At least one of us is reeling under the bombardment of Cretan hospitality. Celestial cheese tarts made by Sofia, George’s wife, have given way to nuts, glistening sweetmeats and, as if that weren’t enough, shots of tsikoudia, a spirit so lethal it feels less like drinking a liquid than sipping scalded air. After three of these, I am not entirely sure whether the spools on my tape recorder are going round: after four, I don’t care. George – one eye sleepy, the other coal black with embers of mischief – is joking about whether he should have given lessons in sheep stealing (a local speciality) to one of the wireless operators. “So when he got back to Scotland he could have organised sheep rustling.” Paddy pretends, unconvincingly, to be shocked. Anyway, height didn’t matter much back then. It was the July of 1942 in occupied Crete and the stature of men was not measured in inches, rather in a bewildering range of abilities. These included: keeping cool when a member of the Gestapo approaches your mule while it is carrying a combustible load of wheat and wireless; keeping warm in a cave-bed with a canopy of stalactites; and finding the courage to tuck into a dinner of local produce – grass cooked with snails. “We took the grass blade by blade, picked off the broken shells and ate it with much laughter,” recalls George. Psychoundakis was a runner for the Resistance – a vertical postman, he delivered messages and equipment at barely credible speed. On a map, Crete doesn’t look too daunting – a sirloin steak beaten to a succulent sliver by a butcher. But it rises so sharply into such broken-toothed cragginess that it is pointless to measure it in miles: the islanders calculate distances in the time taken to smoke cigarettes. George’s wartime business was mainly conducted at eagle-height, or as he felt his way down the vertebrae of his homeland towards some hiding place where even goats didn’t dare. He was 21 years old when he first met the 27-year-old Leigh Fermor. George addressed Paddy as Michali (all the Allied soldiers had Greek nicknames) or sometimes Mr Michali in half-amused respect (irreverence being the key to the Psychoundakis psyche). Paddy, meanwhile, code- named George either the Clown or the Changeling, for his cockeyed wit, his impish insubordination and a magical ability to spirit himself out of trouble. The two men were not just worlds apart: a glance at their biographies suggests you would need to hire a time machine to bring them together. Born in Asi Gonia, a village with a long history of giving invaders a hard time (asi is Arabic for uncommandable), George lived the kind of peasant life that had not changed for centuries. His family slept together in a single room with a beaten earth floor. After a scratchy education at the local primary school, he followed his father on to the mountains as a shepherd. By the time German parachutes blotted out the sky in May 1941, he had visited only two of Crete’s towns and had never seen the capital, Heraklion. By contrast, Leigh Fermor was born into a smart Anglo-Irish family and educated at prep school and King’s, Canterbury. [Just like someone else we know] By 1939, he had walked across every country between London and Constantinople – a stroll commemorated in his two dazzling volumes, A Time of Gifts and Between the Woods and the Water – and also appeared to have drunk in most of their national literatures. Almost 70 years later, I find it hard to improve on that verdict, save to replace the word dangerous with delightful. As it turned out, his influence on other boys was all to the good, and the most remarkable boy of all was George Psychoundakis. While Paddy was in Kent writing “bad and imitative verse” and lapping up ancient Greek because it was a passport to a world of heroes, George was scavenging books from the village priest and the doctor, and occupying the long woolly hours by the sheepfold composing patriotic poems and beady skits on local life. (An early effort entitled Ode to an Inkspot on a Schoolmistress’s Skirt sounds distinctly Paddy-like in its high- flown cheekiness). Although George’s father, Nicolas, was illiterate, he could recite by heart the whole of the Erotocritos, the 17th-century Cretan epic poem that comprises 10,000 lines of rhyming couplets. And the rhythm lodged in the son’s head and on his tongue: poetry to these people was not the object of solemn study but a spur to the spinning of legends and the cue for a bloody good song. 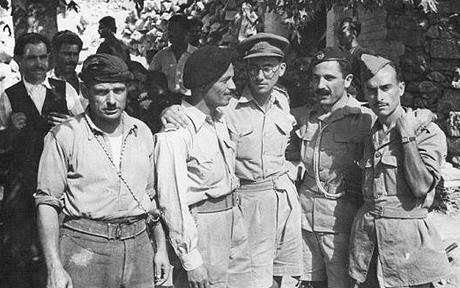 Which is to say that when the ragged and practically barefoot Cretan wriggled into the hiding-place of the Englishman in 1942, they had more in common than an enemy. George spoke only one perfect sentence of English – “I steal grapes every day” – but Paddy soon extended his repertoire. On long marches to the coast to meet supply vessels or during the dark hours awaiting a parachute drop, the Britons taught the Greeks folk-songs and the Greeks taught them mantinadas – waspish local couplets with a sting in the tail. Leigh Fermor, meanwhile, attempted to satisfy Psychoundakis’s ravenous curiosity about the world. What was Churchill like? Why do the Scots wear kilts? How about astronomy, religion, trains? How many sheep does the average Englishman own? 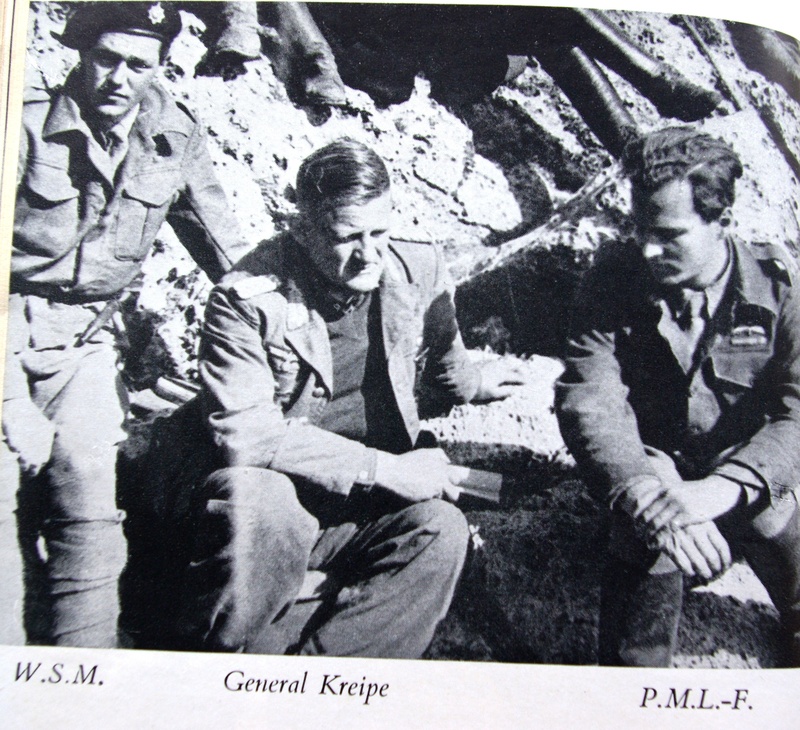 The task of the British Special Operations Executive in Crete was to assist the local Resistance. Having spent centuries in revolt against the Venetians and the Turks, the islanders didn’t actually need much encouragement. During the airborne invasion in 1941, when many young Cretans were away on active service, descending parachutists were met by old men, women and children – by anyone, in fact, who could point upwards and shoot. “Aim for the legs and you’ll get them in the heart,” ran the local wisdom. Four thousand Germans died. Those who survived took swift revenge. Reprisals, read one Wehrmacht memo, “must be carried through with exemplary terror”. Between May and September of that year, 1,135 Cretans were executed. The Cretan Runner begins with the invasion. “Out of the sky the winged devils of Hitler were falling everywhere … the aeroplanes came and went like bees in a bee-garden.” One grounded plane is set upon by furious locals till it resembles “a bit of bread thrown on to an ant-hill”. From the opening pages, you get a pungent impression of the Psychoundakis style – a vertiginous mix of the epic and the demotic, the Homeric and the homely. Of the enemy, George writes: “They reached to our very bowels and provoked a storm in the soul of the race like the hiss of a poisonous snake about to strike.” No British account of the battle of Crete could contain a sentence like that. Too purple. Too embarrassing, frankly. But it feels utterly true to George and the hot-blooded rhetoric of his race. “It was plain that George was enraptured with the excitement of our secret life,” says Paddy. The same could be said of all of them, I think. As a boy Leigh Fermor confessed to being guilty of “a bookish attempt to coerce life into a closer resemblance to literature”. In this case, the literature was Greek. The Cretans, for their part, seemed all too willing to live up to the legends the Englishmen had imbibed at school. Most battles look romantic only in retrospect, if then: Crete was different. It seems to have struck its leading men as touched with an air of romance, even as the drama was unfolding. As they approached by boat on a moonless night, the first the soldiers knew of the island was perfume, the scent of wild thyme that wafts miles out to sea. Once on shore, they changed into local costume – breeches, black bandanas, embroidered waistcoats and spiffy jackboots. There were lessons in how to curl their new moustaches. They were an extraordinary bunch – poets, archaeologists, free spirits thirsty for adventure. SOE chose them because they had some knowledge of ancient Greek. But, as Leigh Fermor explains, since Greek was no longer compulsory at school, those who opted for it had already marked themselves out as “a perverse and eccentric minority”. Looking at the smiley countenance of Tom Dunbabin – a fellow of All Souls in peacetime – you can see why he inspired such love; ditto the gaunt saintly faces of Aleko Kokonas, the schoolmaster of Yerakari, and his wife, Kyria Maria. And then, of course, there are Paddy and George: the first as debonair and unfeasibly handsome as Errol Flynn casting about for a galleon to capture; the second apparently auditioning for the role of Puck. Three of George’s fellow runners were executed, two after what the Wehrmacht would probably have considered exemplary torture. In his superb book Crete: The Battle and the Resistance, Antony Beevor points out that the penalty for a shepherd caught whistling to warn of the approach of a German patrol was death. War had transformed George Psychoundakis’s life. In February 1943, it enabled the former shepherd boy to travel abroad for the first time. He was spirited off to SOE headquarters in Egypt, where he was knocked sideways by wonders, not least the grass in the Gezira gardens: “Fat, short grass like green velvet carpet.” As for the zoo, “I could almost have deemed that I was in the middle of paradise”. The most misguided character in the whole of The Cretan Runner is the soldier who advised George not to climb up the Pyramids because it was “very tiring and tricky”. A short hop later, the Cretan runner got out his stiletto and “cut my name and fatherland” into a stone at the top. On the day the war was over, a “high-spirited Mr Leigh Fermor” bought a dubious Mr Psychoundakis a lot of drinks. “If I drink all that I’ll be drunk,” protested George. “But my child, what is drink meant for? It’s no use for anything else,” replied Paddy. Soon after, in a school where a whole village was gathered together, George recited a heart-stopping poem he had written on the lovely village of Yerakari, now destroyed, where once “white houses lay like doves asleep along the sill of heaven”. He had survived, but for a while it was hard to see what for. Fortune, who had smiled on George in a time of insane adversity, appeared to doze off once the shooting stopped. Because of missing documents and in spite of his British Empire Medal (awarded in 1945), he was arrested as a deserter and imprisoned for several months. One can scarcely imagine the wound inflicted on his pride. Over three days, that great shaggy helmet of hair all fell out. Subsequently, he had to do two more years of fighting in the civil war. Returning at last to Asi Gonia, George found all the sheep stolen and his family in gruesome poverty. The Changeling had run out of magic. George took a job as a navvy working on a road. At night, he sheltered once more in a cave and by the light of an oil lamp began to fill notebook after notebook with a furious, cramped hand. “I think he undertook this task as a kind of exorcism of the gloom of his circumstances, ” says Paddy. When they met up again in 1951, George gave his friend the completed work: Pictures of Our Life During the Occupation. Better known as The Cretan Runner. Leigh Fermor, now living on the Greek mainland, took the precious grime-covered manuscript home to translate. George, meanwhile, was working to help his old friend, too. In 1943, with a German patrol approaching, Paddy, who was checking what he thought was an empty rifle, accidentally shot Yanni Tzangarakis in the leg. He died soon afterwards, but not before absolving his friend of all blame. Paddy was devastated: imagine killing the proud son of a country for which you were willing to lay down your own life. This wretchedness was deepened by foolish rumours that eventually led to a vendetta being declared by some of Yanni’s relatives. This was only laid to rest after years of delicate negotiation by George, who found a very Cretan solution to the Englishman’s impasse: Paddy Leigh Fermor became godfather to Yanni’s great-niece. In Greek society, this bond is deeper than blood. Two old men sitting at a table talking about the war. A Cretan and an Englishman. “We’d better censor that, George, it’s libellous,” says Paddy, trying to sound stern. As usual, he fails. O bathos that the years must fill. Since the war, both men have found satisfactions. Leigh Fermor, though unfairly saddled with the label of travel writer, has become one of the greatest exponents of English prose. Psychoundakis, meanwhile, has translated both the Odyssey and the Iliad into Cretan and been honoured by the Academy of Athens. Still, I can’t help wondering whether the time since their great adventure had been an anti-climax. Just as we are getting ready to leave, George gives Paddy a photograph. It is of George himself and Xan Fielding, taken somewhere in the mountains. You can just make them out. The emulsion is breaking up and great snowy specks of it are blizzarding them into oblivion. Yet looking back at the Cretan resisters, we see only a thrilling clarity. Their existence was both mortally serious and a great wheeze – perhaps a definition of the best kind of life you can hope to lead. A man can think the wildest thoughts and make them all come true. This entry was posted in Ill Met by Moonlight, Other Writing, Paddy in the News, Paddy's Friends and tagged Cretan resistance, Cretan Runner, Crete, George Psychoundakis, Ill Met by Moonlight, Patrick Leigh Fermor, Second World War, SOE, William Stanley Moss on October 24, 2010 by proverbs6to10. A second obituary of George who as a fit young man risked life and limb running messages for the Cretan resistance and then for the SOE operatives in Crete. Paddy helped to get George out of gaol (when he was mistakenly detained by the Greeks as a deserter) and then translated The Cretan runner into English. AS a runner for the Resistance in Crete during the German occupation, George Psychoundakis carried messages over vast distances across one of the most mountainous regions in Europe. It was a life of constant risk — runners captured by the Germans were often tortured and shot. Wearing worn-out boots and with a minimum of rations, Psychoundakis would cover up to 50 miles in only a few days. The threat from collaborators meant that he often had to avoid villages, thus depriving himself of comforts that would have eased the rigours of his journeys. Psychoundakis approached his missions with a humour and a charm that made him a popular figure in the Resistance, as well as with the British officers serving under cover. One officer was the writer Patrick Leigh Fermor, with whom Psychoundakis formed a lifelong friendship. It was Leigh Fermor who translated Psychoundakis’s account of life under the occupation, The Cretan Runner, republished in 1998. In his foreword Leigh Fermor writes how he was captivated by the Cretan’s “gift for play on words, for funny repartee, light verse, improvisation, unpredictable flights of imagination and his instinct for teasing the great . . . which earned him a universal licence as a jester”. More than merely fleet of foot, Psychoundakis was quick of mind. Before the war, as a shepherd boy, he was fascinated by literature. Among a barely literate population, he had to pester the village priest and the doctor for books, and even composed his own epic poems. Psychoundakis represented the Greek oral tradition: he had even composed a two-hour-long poem about the war. It ended with George firing Leigh Fermor’s pistol into the air, swearing vengeance on the German “ cuckolds”. At night and when the weather was awful, Psychoundakis would sit with his comrades in their caves, reciting the 10,000 lines of the 17th-century Cretan poem, the Erotokritos. 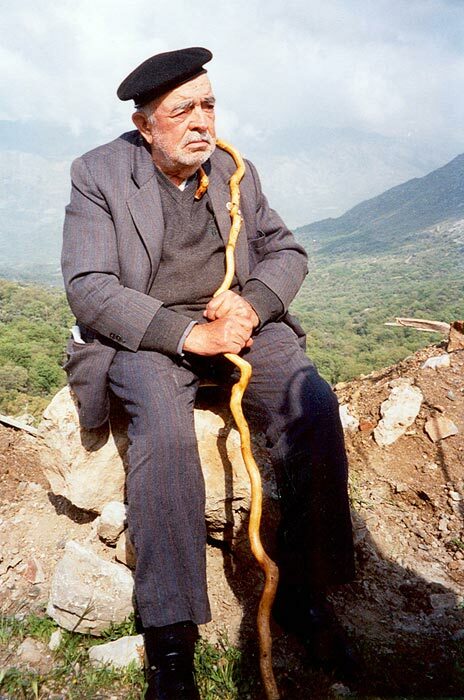 George Psychoundakis was born in 1920, the son of a shepherd from the village of Asi Gonia in Western Crete. The family was very poor — Psychoundakis, his two sisters and brother were raised in a one-room house — and owned only a handful of goats and sheep. After a few years at the village school Psychoundakis too became a shepherd until the German invasion in May 1941. Had the invasion not happened, it is probable that he would have remained an unknown shepherd, eking out a tough existence on the craggy Cretan landscape. But the occupation allowed him to broaden his horizons, for the contacts he had made with scholarly warriors such as Leigh Fermor gave him the opportunity to make a name for himself as a man of letters. But the transition from mountain boy to writer was not easy. Despite being awarded the British Empire Medal after the war, Psychoundakis was arrested as a deserter and imprisoned for several months, losing his thick head of hair through worry. Afterwards, he was forced to fight in the civil war, returning to Asi Gonia after two years to find his family poorer than ever. It was then that he wrote The Cretan Runner. When he and Leigh Fermor met again in 1951, Fermor marvelled at the uniqueness of such a document. Most writing about the occupation had been by the English or the Germans, but here was a heartfelt testament to the horrors of being occupied. The book was published in 1955, and became a great success. Written in a simplistic style, it is an episodic account of hardships and dangers, with moments of great humour set against a background of murder and torture. Even after the publication of The Cretan Runner, Psychoundakis continued to live in Asi Gonia. There he translated the Iliad and the Odyssey into his Cretan dialect, and he was honoured by the Academy of Athens. He lived off the land and held a variety of jobs. That one of these was as the caretaker for the nearby German cemetery was a shining example of Psychoundakis’s sense of forgiveness. He is survived by his wife, Sofia, their son and two daughters. George Psychoundakis, BEM, shepherd, partisan and writer, was born on November 3, 1920. He died on January 29, 2006, aged 85. This entry was posted in Obituaries and tagged Cretan resistance, Cretan Runner, Crete, George Psychoundakis, Patrick Leigh Fermor on June 9, 2010 by proverbs6to10. The obituary that follows is of George Psychoundakis, who as a young man was a runner for the resistance in Crete during the German occupation in World War II. First of all he ran for local partisans groups or andartes, but from about 1941 he did most of his work with the Special Operations Executive. At the end of the war George was mistakenly taken for a deserter and locked up. He spent around 16 months in gaol and whilst there he wrote his wartime memoires. Somehow Paddy became aware of his incarceration and had George released. He then helped George by translating his memoires into English and sorting out a publisher. 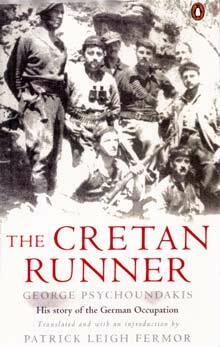 The book has been translated into many languages and is called The Cretan Runner. This obituary includes a section written by Paddy at the end. George Psychoundakis, who died at Canea, Crete, on January 29 aged 85, was best known for his extraordinary account of clandestine life in the Resistance after the German occupation of his island in 1941; the book was translated into English by Patrick (now Sir Patrick) Leigh Fermor, and enjoyed success in Britain as The Cretan Runner. George Psychoundakis was born on November 3 1920 at the village of Asi Gonia, perched high in a mountain pass in central Crete. He was the eldest of four children, born to a family whose only possessions were a single-room house and a few sheep and goats. Education at the village school was basic; but unlike most of his fellows George learnt to write as well as read, and gleaned what learning he could from books lent by the schoolteacher and the village priest. When the German invasion of Crete began, he was 21, a light, wiry, elfin figure who could move among the mountains with speed and agility. While the Germans imposed their rule with the utmost brutality, Psychoundakis was among the many who guided straggling Allied soldiers over the mountains to the south coast, from where they could be evacuated. As the Resistance grew more organised, Psychoundakis became a runner, carrying messages, wireless sets, batteries and weapons between villages and secret wireless stations, always on foot, always in danger, often exhausted and hungry, over some of the most precipitous terrain in Europe. 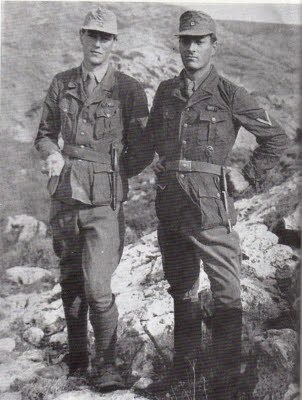 Patrick Leigh Fermor, one of a handful of SOE officers whose job it was to co-ordinate the Cretan resistance, first met Psychoundakis at the end of July 1942 in a rocky hide-out above the village of Vaphé. The messages Psychoundakis was carrying were twisted into tiny billets and hidden away in his clothes: “They were produced,” wrote Leigh Fermor, “with a comic kind of conjuror’s flourish, after grotesquely furtive glances over the shoulder and fingers laid on lips in a caricature of clandestine security precautions that made us all laugh.” His clothes were in rags, one of his patched boots was held together with a length of wire – but his humour and cheerfulness were infectious. Humour and danger went hand in hand. Psychoundakis told how a couple of German soldiers decided to help him with an overladen donkey, which was carrying a heavy wireless set under bags of wheat. The Germans beat the poor creature so hard that Psychoundakis was afraid they would knock off the saddle-bags – but mercifully their attention was drawn to some village girls, and the soldiers started flirting with them instead. At the same time, the harshness of everyday life was everpresent. Near starvation at one point with another SOE officer, Jack Smith-Hughes, Psychoundakis described how they picked broken snail shells off blades of grass and ate them, pretending that each was more delicious than the last. This entry was posted in Obituaries, Paddy's Friends and tagged Canea, Cretan resistance, Cretan Runner, Crete, Erotokritos, George Psychoundakis, German, Ill Met by Moonlight, macedonia, obituary, Patrick Leigh Fermor, WW2 History on May 17, 2010 by proverbs6to10.